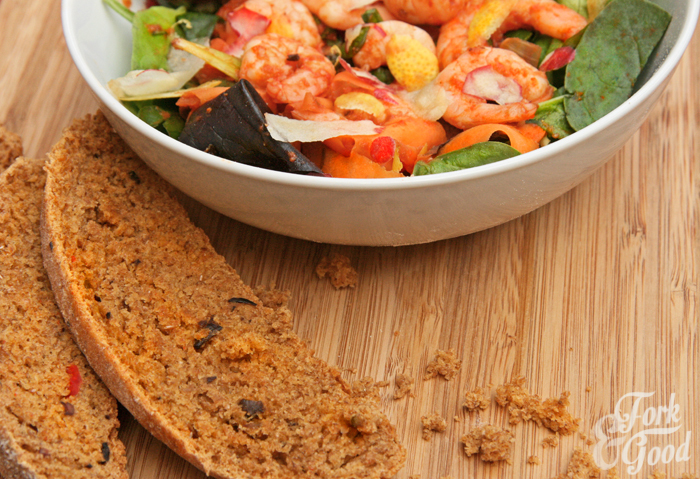 King Prawn & Chorizo Salad with Garlic & Olive Loaf - Fork and Good. So at the end of last week, Fragata sent me a box of goodies to play around with. It just so happened to coincide with one of the warmest weekends of the year so far, so I got to cook with these brilliant flavours as the sun beamed down on us. I've been meaning to make an Olive bread for a while, but when do I ever remember to buy olives? Never, that's when. So it was like a little gift, to be sent the one missing ingredient for my bread. 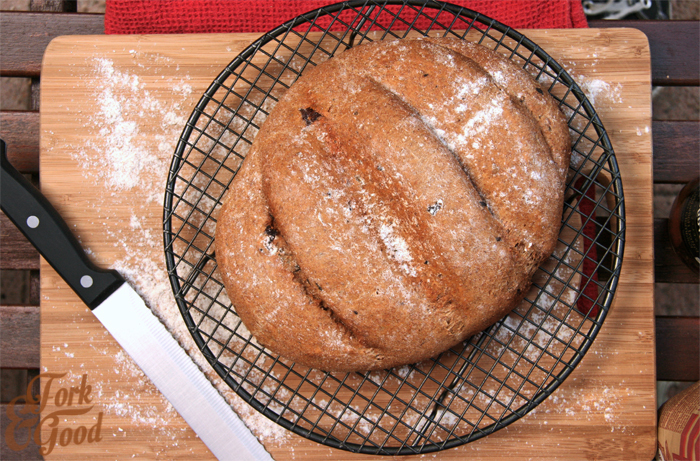 What goes well with a nice slice of warm olive bread? Apparently the answer is salad, cause that's what I made. Ohhh, the money shot. I love a good picture of bread, don't you? I may, or may not - have a private board on Pinterest devoted to pictures of bread and cheeses. So salad. It's kind of got a bad rep round these parts. It's called names like rabbit food and boring when it's anything but. Okay, we've all had a bad salad. I ordered one at a restaurant once, and I swear, for £10 all I got was a handful of watercress, some rocket leaves and a slab of unseasoned meat. It's enough to put anyone off. But then you go abroad. Somewhere hot and sunny. You find yourself feeling hungry and dive in the first place you see. The man greets you, offers you a menu. You decide to be good and have a salad. It comes. It's embellished with radish flowers, carrot curls, roasted seeds, warm slices of squash, grated fresh fennel, fresh herbs, grilled halloumi and a warm slice of freshly baked loaf on the side. Your love in salads is restored. They don't have to be boring, every mouthful can be different. That is exactly what happened to me, a few years back on holiday. Ever since, I'm a big believer in salads being a proper meal. Something to enjoy, instead of have "because I'm being good". I like my salads messy, tossed, chopped, torn and mixed in with some brilliant flavours. They have to pack a punch, because if that's what I'm having for dinner, it has to be something other than lettuce leaf and unidentifiable slabs of meat. You will need to prep your dough. In a bowl, mix your flour and butter together until slightly resembles breadcrumbs. This might take a few minutes. In a jug, mix together your dried yeast, caster sugar and warm water. Leave to one side for about 15 minutes (it will start to gently froth). Back to your mixing bowl, add your paprika, garlic & salt to the flour. Give it a good mix. Chop your olives into quarters and add the rest of the drained jars' contents into the dough. Once again, give it a really good mix. Finally, slowly add the yeast mixture to the bowl until a dough forms. Once your dough has formed, start kneading it on a floured surface. Or, if you're using a mixer, keep it on a low setting for about 10 minutes). The dough is done once it becomes more elastic and easier to knead. Pop it back in your mixing bowl, lightly dress in oil, and cover the bowl over with cling film. Leave to rise. It's ready once it's doubled in size. The time this take varies. If the dough is left somewhere warmer, it will rise quicker. Once your dough has risen, take it from the bowl and knead it again for a few minutes. Then shape it, place it on an oiled baking tray, lightly grease the top with oil, cover with kitchen towel and leave to rise again. Painstaking, but I promise it's worth it. Preheat your oven to 200°C/400°F/Gas mark 6. Once it's preheated, place your bead in the oven, and leave to cook for 20-30 minutes. It's done once the crust browns. You will have to be the judge of when it's done, every oven cooks bread differently in my experience. 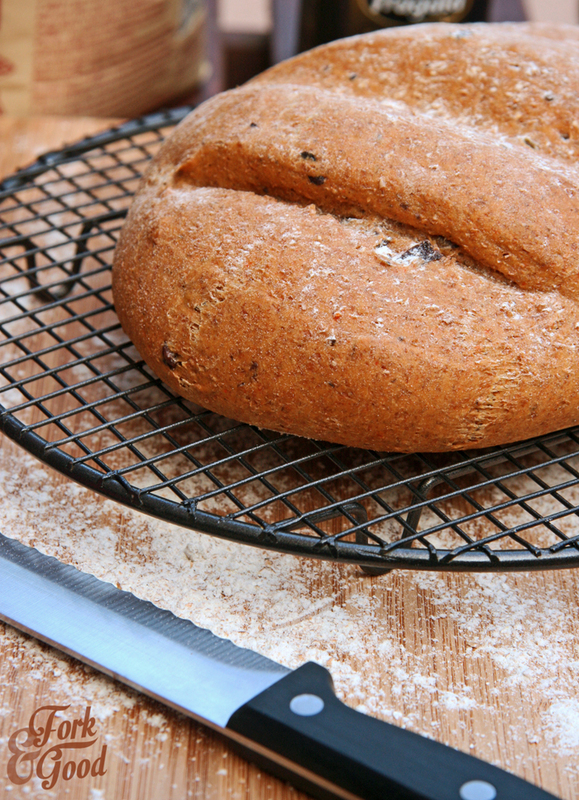 A good test is to knock the bread on the bottom - if it sounds hollow, it's done. Leave on the side to cool. In a food processor, blitz the tomato puree, hot pepper, olive oil, smoked paprika & water until completely blended. If you don't have a food processor or a blender, chop the pepper up as fine as you can and mix everything together. In a small pan, put your chopped chorizo. Cook it lightly for a few minutes before adding in the sauce you just made in the processor. Let it simmer on low for a few minutes. Then take off the heat and leave to cool. Next prep your salad leaves. For mine, I chopped up a red onion, used a peeler to make fine curls of carrot, chopped up some baby spinach and baby leaf. I tossed it all together in a bowl and added some chopped radish. 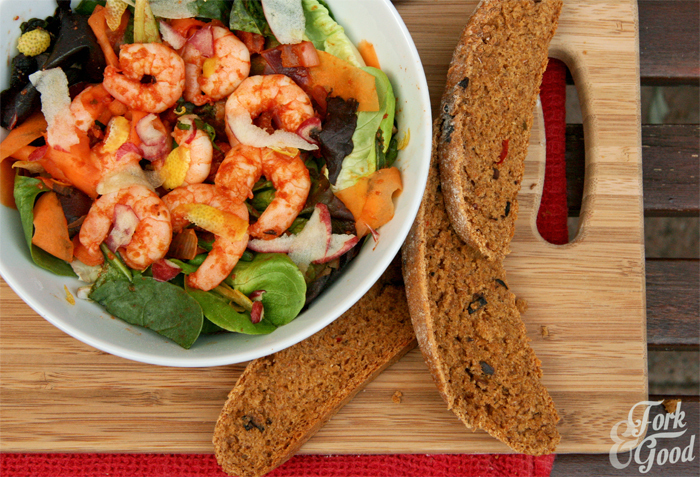 Pour your warm sauce & chorizo onto your salad, add in your prawns and give it a good toss around to make sure it's all covered. Put in a bowl and grate a little bit of lemon peel onto the top. Not too much, otherwise...well...blergh!! Finally, slice yourself off a bit of loaf, and serve with your salad. Done! Thanks to Fragata for sending me the lush jars of olives that went in this bread. Beautiful. but I love your bread it looks so crunchy and delish! Ahh a shame :) Yay for bread though! The bread looks terrific! And perfect to serve with the salad. A satisfying and delicious meal, Emma. Beautiful salad.. Loving the flavor going on here!!! Lets not forget that loaf!! Must have been phenomenal!! Your entire meal looks perfect!! My kids have discovered that they really do like prawns, and I love chorizo. Sounds like a perfect combo to me! Yes Emma, you are the not alone! That photo of the bread looks freaking amamzing! :) this meal looks delish! 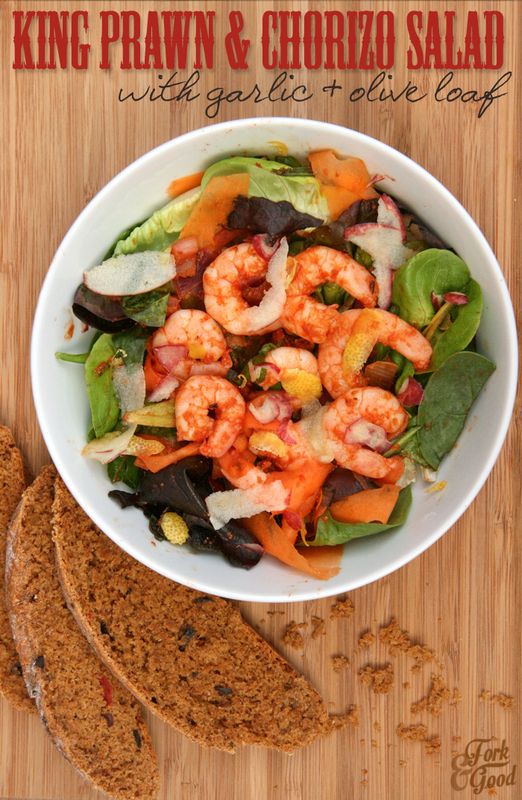 This salad looks so summery and delicious, but the bread takes it all the way! A perfectly paired meal. Lovely! Love this bread look amazing! !